StudentUniverse now offers discounted flights on South African Airways (SAA), Africa’s most awarded airline and the best way to start any African experience, to students, faculty and youth (under 28 years old). We offer discounts on routes U.S. to/from Africa and on all global routes operated by SAA. South African Airways takes the world to Africa and brings Africa to the world. SAA serves 67 destinations worldwide in partnership with SA Express, SA Airlink and its low cost carrier, Mango. 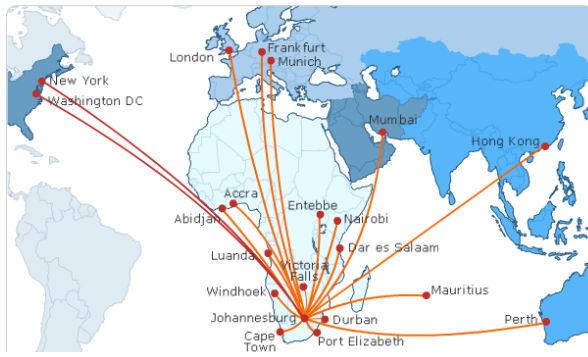 Flights travel within South Africa and across the continent (including Namibia, Mauritius and Harare, Cape Town and Zimbabwe), and include nine intercontinental routes from its Johannesburg hub. At the recent 2015 Skytrax World Airline Awards, SAA won awards for the Best Airline in Africa, for the 13th consecutive year and the Best Airlines Staff in Africa, for the fourth time. Learn more about South African Airways, and search for a South African Airways flight today.